1. Sticheron idiomelon of the First Great Hour. (5th - 6th c.). Plagal II (tetraphonos). (in Arabic). Mode IV chromatic. from the first and second kanons of Epiphany, Mode II. 9. Sticheron idiomelon. Mode I. 15. 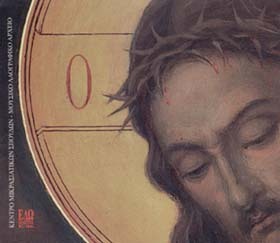 Hymn of the Orthros of the Holy Friday. 17. Lamentation of the Orthros of the Holy Saturday. 18. Second stanza. Plagal I. 19. Third stanza. Mode III. 20. Sticheron of the Resurrection. Plagal I. 22. Sticheron idiomelon. Mode I. 23. Sticheron idiomelon of the lauds. (from Crete), (18th -19th c). Mode I. 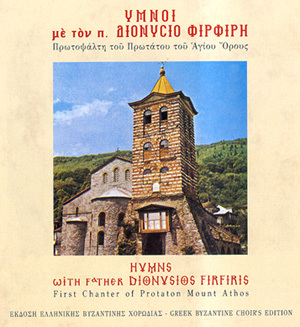 The recording was made in Karyes, Mount Athos, July 1982, by Lycourgos Angelopoulos. 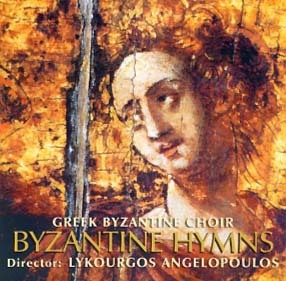 The drown is sung by deacon Chrysostomos Firfiris, Lycourgos Angelopoulos and loannis Papachronis. 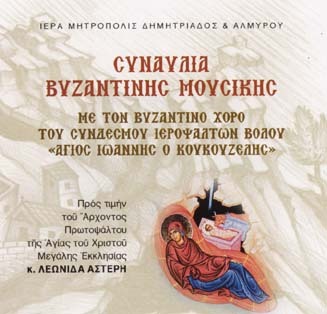 of the Vatopedion Holy Monastery, Mount Athos and the Crete University Publication. Serbian Woman Choir ???St. Kassiane??? St. George Patriarchal Monastery, Al-Humayrah Talkalakh, Syria. Listen to both sound extracts by clicking here.